In a saucepan, heat 1/2 cup milk, water, and 2 tablespoons butter until warm. Stir in yeast and keep aside for 5 minutes. Break the egg into the yeast mixture and mix well. In a large bowl, mix together the dry ingredients (flour, sugar and salt), pour the milk-yeast-egg mixture, and knead to form smooth dough. Place in a lightly greased bowl and leave in a warm place to rise for about 1 hour. 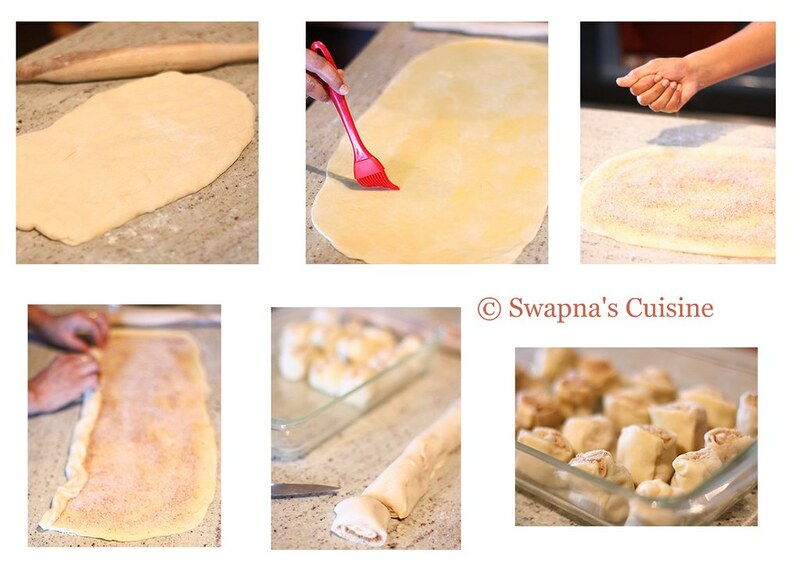 Punch down the dough and on a floured surface, roll it into a large rectangle. Smear with the softened butter. Combine the cinnamon and 1/3 cup sugar. Sprinkle over the rectangle. Roll the dough up into a log starting at the long side. Cut into 12 slices. Place the rolls cut side down into a 9x13-inch greased baking pan. Cover, and let rise in a warm place until almost doubled, about 30 minutes. Preheat an oven to 375 degrees F (190 degrees C). Bake rolls in preheated oven until golden, 20 to 25 minutes. Remove and allow to cool 10 minutes. 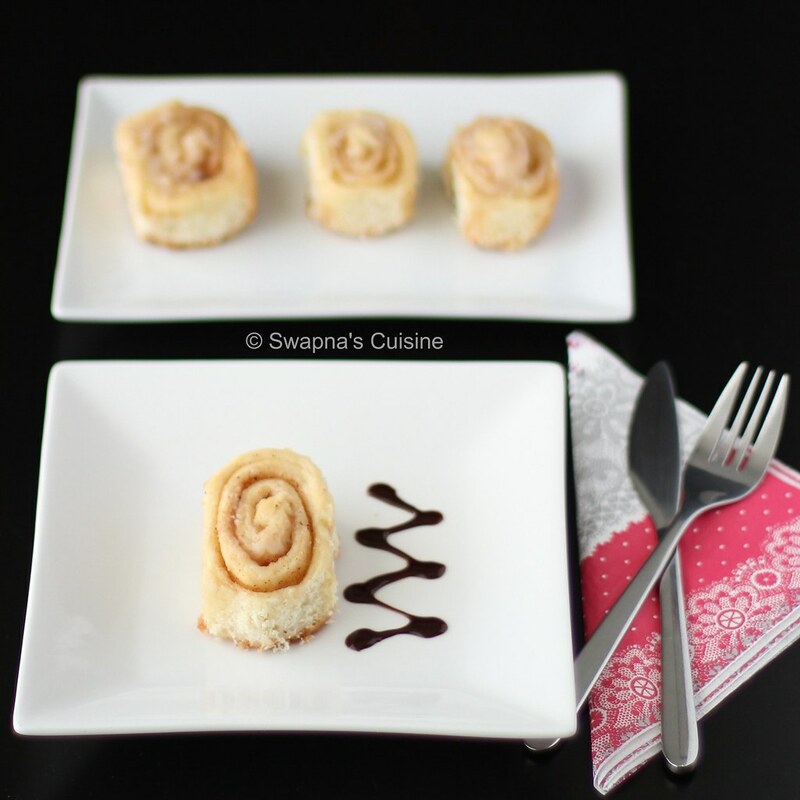 Meanwhile make the frosting by combining the confectioners' sugar, melted butter, vanilla extract, and milk into a thick frosting; Spread frosting over baked warm rolls. Enjoy your warm homemade Cinnamon Rolls! I felt the amount of cinnamon and sugar in the filling was not enough and so I always double the amount in the filling (or may be our taste buds are too sweet :D). You can use brown sugar for filling if you like. If you like to have raisins and nuts in your rolls you can add 1/3 cup each of raisins and walnuts, like in the original recipe. Since I am making it for my son I prefer smaller rolls; so instead of cutting the dough into 12 pieces I cut them to 24- 30 pieces. It’s best served warm, Microwave it for a few seconds before serving and my little one loves it topped with some chocolate sauce. Ho,My fav..pass me the plate Swapna. Looks yum and easy, will definitely try it out. Looks delicious. I love cinnamon buns but we buy it from the store. Such a nice post. Makes me want to make it too. I love the simplicity in your presentation--these look delicious! Cinnamon rolls are my favorite too!!! I bake them a lil more to get the golden brown color!! Tried this recipe, super easy and superly delicious!!!! do u use salted or unsalted butter?